Ouch! 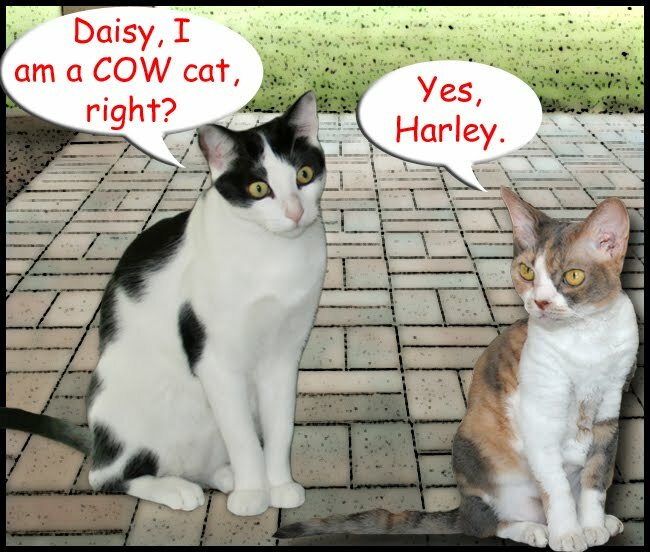 You and Harley are too punny today, Daisy! Aw mommeh should take your show on the road. You two are playing nice on a Monday morning. Thanks for the smiles-makes going to work at my job much nicer now. Oh we love those corny old jokes! Hahahahahaaaa! 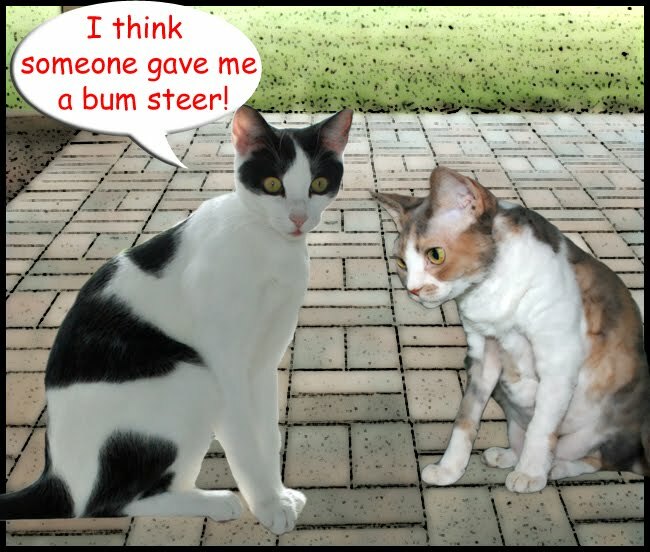 Happy World Cat day to two very sweet friends! Harley, you are handsome and very funny too! We love cow cats. I love Punny Monday Funnies! p.s. to Daisy, I was glad to read your potty is GOOD! You really know how to milk the laughs, Harley! Daisy that was a good one for sure. 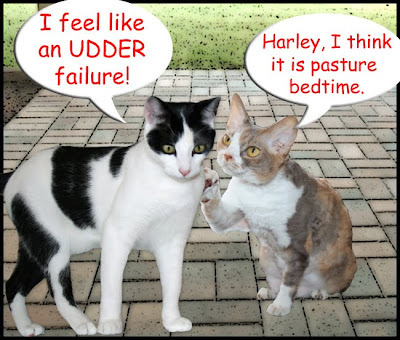 Loved the pasture bedtime. Happy World Cat day you two. Be sure to get some extra treats today. Thanks for the laugh Harley, our Mom really needed it this morning. You're really "MILKING" this cow thing... aren't you! Happy World Cat Day, pretty girl Daisy, and happy handsome Mancat Harley! Wooohooo.... You guys are sure playing with your words today. HA! 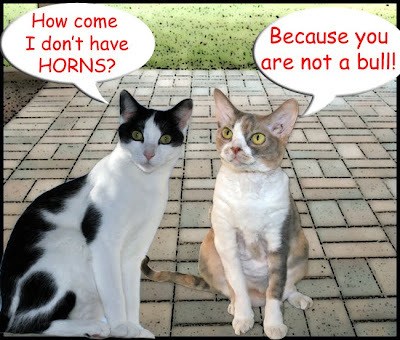 Happy World Cat Day to both of you. You two made us have big grins today. Happy World Cat Day. You two are becoming a really good comic team! Now if you could only learn cow talk you could have an entirely different audience to milk..um...moove...um...pasturise??!! Happy World Cat Day, dear friends! Hmm, sure seems like there is lots of "bull" flying over there today! Bawhahahaha! Thanks for the Monday smiles! Harley, don't let Daisy fool you. cows and steers can have horns, too! We live your funny Mondays! Oh, you guys failed to moooove me with your jokes. That's a very funny comic! Tee hee! You're a handsome cow cat! We were MOOved to laughter! I like when someone said "you really know how to milk the laughs!" MOL!!! A cow cat. That is so cute! BTW, I have a contest for a free bag of Natural pet food. Today is the last day to Enter if you are interested! You're both on top form today! I will laugh later cuz I is too crabilated to laugh right now! If heifer we need a laugh, we always know where to come to. LOL!! You two are so funny!! Hahahah! I love you friends... I ever lagugh too much here! Oh Harley..... No Horns.. oh well, no worry you are still cute. Don't get your CUD in a knot it aint worth the worry. PS Ever thought of a trip to India..... cows are totally sacred there! Pretty darn amooooosing, you two. Every Monday, we can count on a goof laugh from you two. We have been spotty commenting today so we are going to try to zip around this evening and tell our friends we hope they had a great World Cat Day and may it be a fab World Cat Year! A Punny Day with a chuckle that is needed with everything going on.